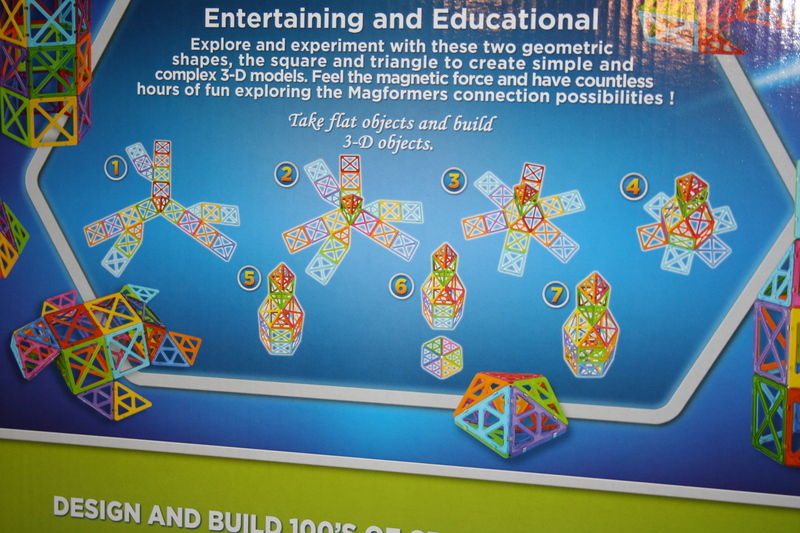 Magformers, magnetic toys, made a great educational gift for my daughter. Made from rare earth magnets called neodymium, the magnetic pull in the toy was super strong to make the item non-frustrating for my daughter. As a homeschooling mom to a preschooler, I was excited to try out a couple boxes of the product to evaluate the educational value that the toys brought. Because my favorite class in graduate school was about teaching science to elementary education students, I happily used the product in a science unit with my daughter. 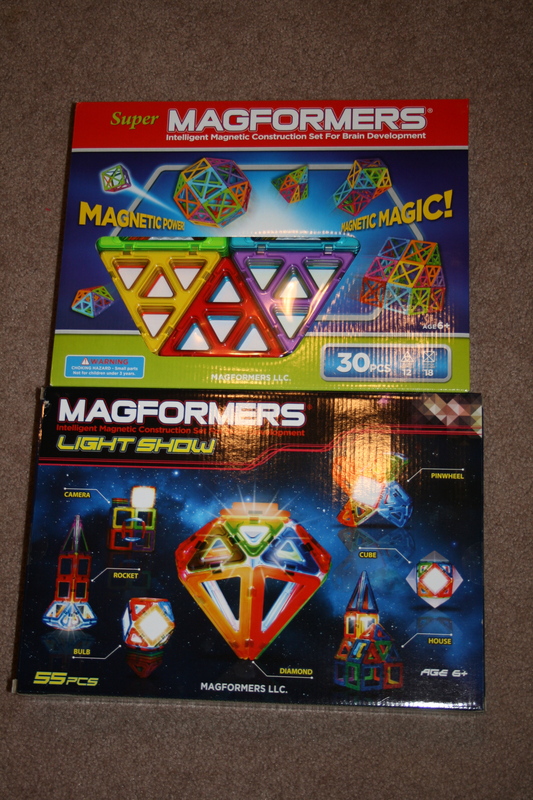 I received the Super Magformers 30 Piece Set as well as the new Light Show magnetic toy sets to review. My 3 1/2 year old daughter Samantha loved studying the science of magnetism with me. I incorporated the magnetic toys as manipulatives into a unit that lasted several days. Part of my unit involved traveling to the local Adventure Science Center where my daughter examined important exhibits, such as Magnet City, where she learned about the considerations that are important to builders. When we revisited the concept of magnetism the next day, we studied how typical magnets repelled each other but stuck on the refrigerator. Later, I built on my daughter’s prior knowledge and introduced the Magformers sets with a song, “The Magnet Song,” sung to the tune of “I’m A Little Teapot.” We were all set to study how the magnetic building materials were different from some typical magnets. While my daughter and I studied the product, we sang “The Magnet Song.” My daughter was very entertained. Because the magnet toys used free floating magnets, which rotated, the magnets never rejected each other and always connected. When we began studying magnetism with the product, I started with the basic Super Magformers 30 Piece Set. I permitted my daughter to do whatever she wanted with the manipulatives. Free play at the beginning of my lesson was key to creating order. After free play with the product, I worked with my daughter and scaffolded information for her. I modeled how to lie the items flat and to pull them up to create objects with the magnets. As my daughter worked with the manipulatives, I saw her make increasingly complex structures the more she played with the product. Later I introduced the Light Show product when our family watched a movie at night. My daughter was wholehearted entranced with the product. I could tell that my daughter had learned a lot about how the magnets worked when I saw the structures she was building. Our whole family enjoyed participating. Building with the Light Show product helped create a wonderful family activity during the movie. In the future I plan to continue building my daughter’s collection of Magformers as she had fun and learned a lot with the product. I received free items, but it in no way influenced my opinion. Theresa has been writing since 2010 in magazines and online. Her lifestyle and parenting expertise has been featured in publications, including ShopSmart and Scholastic. She earned an M.Ed in Elementary Education from Vanderbilt as well as a BA in History from Flagler College, and she is a certified teacher.